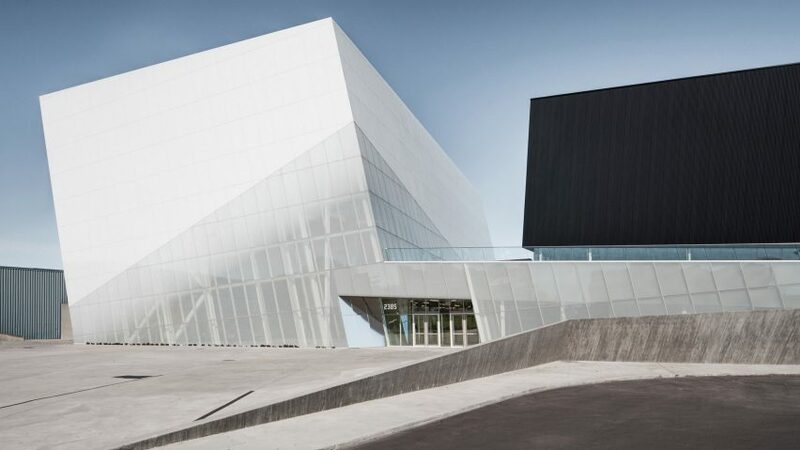 The Complexe Sportif Saint-Laurent in Montreal by Canadian firm Saucier + Perrotte has icy and black exteriors, contrasting the glossy orange surfaces found inside. Measuring 153,924 square feet (14,300 square metres), the complex is divided into two monochrome structures that together house an indoor soccer field, two swimming pools, a basketball court, fitness centre and cafe. Locally based Saucier + Perrotte Architectes designed the project, which was awarded the American Architecture Prize in the Recreational category earlier this year. 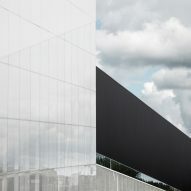 The structure includes two large buildings; "one prismatic, white and diaphanous, the other darker and stretched horizontally," according to firm. The shapes and glazing details on these volumes make them appear to be breaking out of the ground at angles. The light-coloured portion is reminiscent of a huge chunk of ice, while the black building could be likened to a protruding volcanic rock. The design is intended to form a relationship with the area's existing buildings, which are horizontal and neutral-toned, as well as a nearby park and planned green belt. "The sculptural nature of the project creates a strong link between these two natural elements in the urban fabric," said the firm. Inside the white structure are the centre's two pools. White tiles surround the perimeters, while ceilings are coloured in bright orange with a high-gloss finish. Because of the ample natural light that enters the space, the pools' sky-blue colour pops against the orange and white elements. The recreational pool area features an orange spiral slide, and the Olympic-sized swimming pool has a second-storey overlook with orange glazing. The complex's black volume houses three indoor soccer fields, where the expansive green courts also contrasts the raised, glossy orange perimeter. Ceilings are painted charcoal, with matching metalwork used throughout. Bright colours are a characteristic of Saucier + Perrotte's designs. 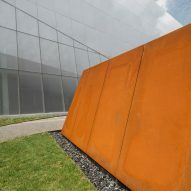 Examples of the firm's projects around Montreal include an angular, slate grey soccer stadium with a rusty orange entryway, a caramel-coloured staircase at a nearby college, and a dark warehouse with red pillars for a local boutique. The firm was founded by Gilles Saucier and André Perrotte in 1988, and the two were awarded Quebec's highest prize for a lifetime achievement in the fields of architecture and design in 2014.